Elder Henry Solomon was born on October 15, 1922 to late John P. and Daisy Solomon in Hampton County, South Carolina. One of nine children, he was raised in a Christian home. He was educated in the public schools of Hampton County. He met and married the love of his life, the late Thelma Johnson-Solomon. They enjoyed forty-eight years of marriage before, in 1991, she preceded him in death. To this union five children were born. Elder Solomon was filled with the Holy Ghost and became a member of the Furman New Church of Christ in 1957. He served faithfully as a member, deacon, and later was called to minister the gospel. 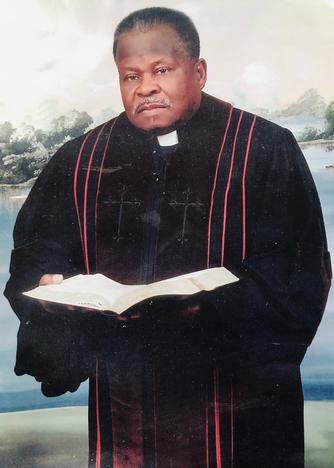 Elder Solomon pastored three churches during his ministry: Gillisonville, Varnville, & Fennell New Church of Christ. He also ministered over the air ways with WBHC, Hampton, South Carolina for over thirty years. Elder Solomon was beloved in the community by all. There was no stranger he ever met. He considered himself a full-time preacher who enjoyed spreading the word of God wherever he went. Some would hail him as the walking Bible; but rest assured, when you came in contact with Elder Solomon, you would always be left with a word of encouragement. He was preceded in death by two sons: Freddie & Will Solomon; two daughters: Evelina White and Linda Wright. Elder Solomon leaves to cherish his memories three children: Daisy Herbert (Jimmy), Cora Antoine, and Lila Mae Solomon all of Queens, New York; One brother, Bobby Solomon of Pineland, South Carolina; two daughters-in-law: Alean Solomon of Beaufort South Carolina, and Lurean Solomon of Hampton, South Carolina; 24 Grandchildren; and a host of Great grandchildren; nieces; nephews; other relatives and friends.